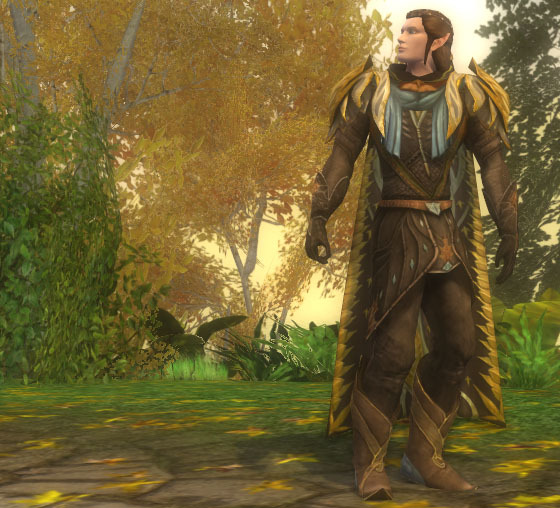 This outfit is inspired by the great golden Mallorn trees of Lothlorien. Mellyrn are described as similar to birches: their bark was smooth and silver-grey, and the leaves turned golden in autumn. The golden leaves remained on the tree through the winter and fell to cover the ground in the spring, when new leaves sprouted, which were green on top and silver underneath, and golden flowers bloomed on the branches. Frodo Baggins explained that he could feel the life of the tree when he touched a mallorn in Lothlórien. Lothlorien was the only place where the golden Mallorn tree grew in Middle-earth, brought there from Valinor by Lady Galadriel. 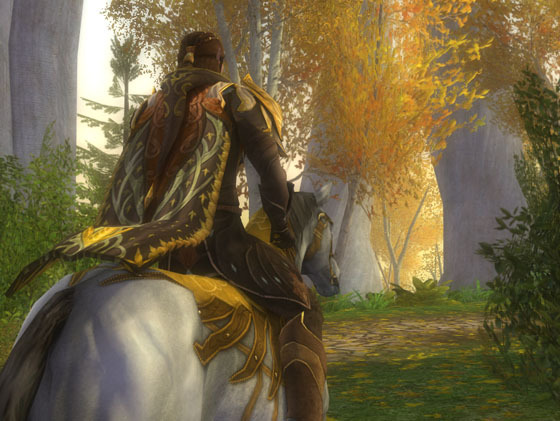 Lothlórien became known as the Golden Wood because of them. Galadriel gave Samwise Gamgee a box of soil containing a single silver mallorn nut. After the War of the Ring, Sam planted the nut in the Shire, in the Party Field where the Party Tree had stood. It was the only mallorn-tree in Middle-earth outside of Lórien. When the tree bloomed in the next summer it was said that all the Shire became golden from the flowers. 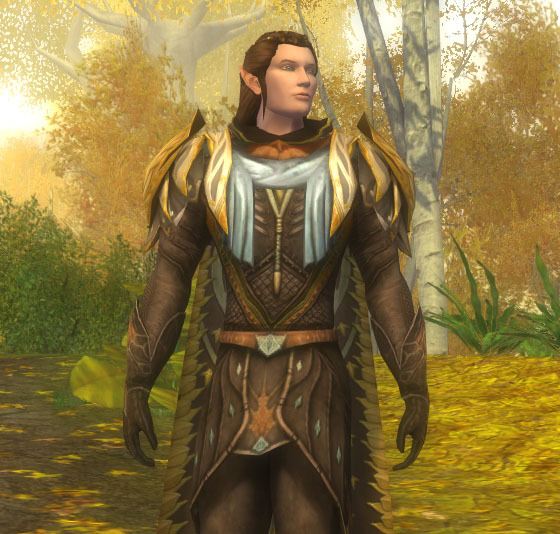 These shoulders can be bartered in Mirkwood at the Loremaster trainer for Medallions of Dol Guldur. 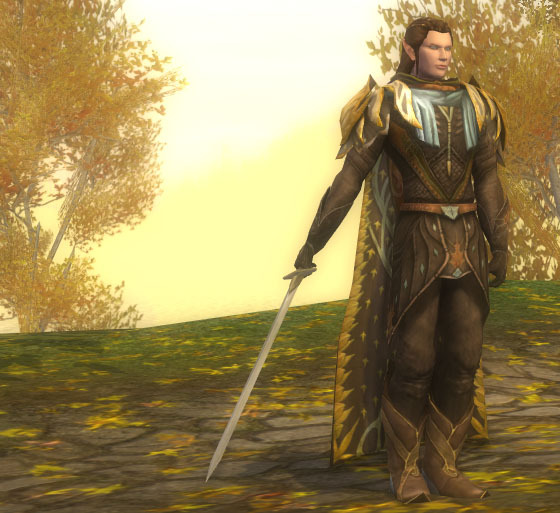 You will need to have a Loremaster to interact with the trainer but the medallions can be earned pretty easily through running Mirkwood instances. I don’t see too many people using this chest piece. The main reason I think is because it is from a quest in the Great River which shares the same quest reward as the very popular Ancient Inlaid Breastplate. (same appearance as the old heavy PvMP armour for guardians, captains and champions) I love that heavy metal robe and will definitely take another character through the quest line to pick it up, but I really thought this leather chest piece looked unique. I had to have it. This outfit works very well with the Prized Malledhrim Horse which can be acquired once you have reached kindred standing with the Malledhrim. Very stately… just like your last one! 🙂 I love the chest piece and yes, I’m currently taking my second character through Great River just so I can get the pieces I didn’t pick up the first time ’round. These shoulders are beautiful. I really should level my Loremaster, but she’s not even 30 yet. Haha, first, a lynx. Then someday, (maybe in the sixth or seventh age of Middle Earth), I’ll get her to Mirkwood. Simply a lovely and elegant outfit, and I love the use of the cloak! It’s one of my favorites, but it seems so underutilized by the vast majority (at least on my server). Thank you Bluet. 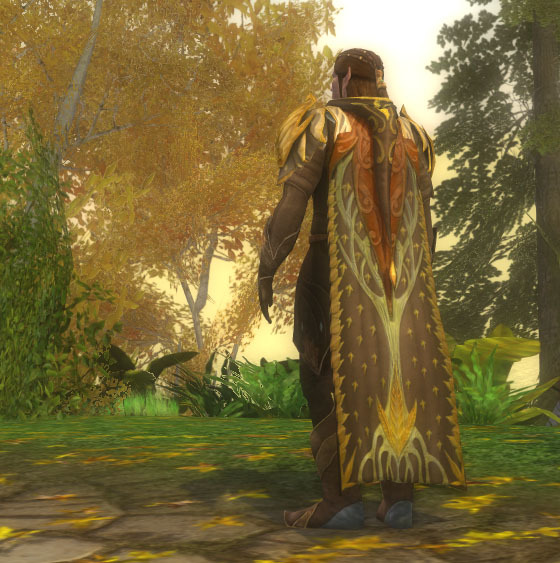 I really love this cloak also. I think it works really well especially during the Autumn season with all the beautiful fall colors on it. Oh, this is lovely. Stately and grand and autumnal. I love that first screenshot. The shoulders are just fantastic with the cloak! Oo I love this! The browns and golds look so nice. I’ll have to pick that chest piece up on my next character I take through there. I’ve always had a hard time matching that cloak to outfits but it looks perfect here! Awesome job! Very gentle pictures, I like the soft earthy colours. Lovely autumn inspiration! Yes, the trees originally did come from Aman… but Galadriel didn’t bring them with her. 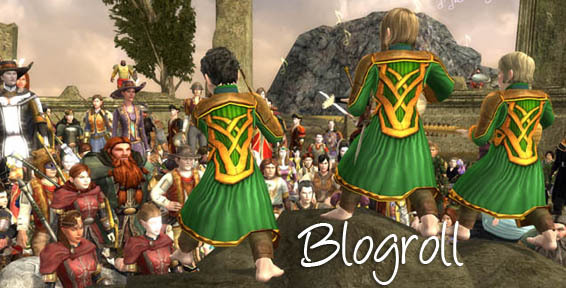 The elves of Tol Eressëa gave the fair trees as a gift to the Númenoreans, and one of their kings (Tar-Aldarion, I think) gave their seeds to Gil-Galad. The trees didn’t flourish in his kingdom in Lindon, though, so he gave them to Galadriel… who managed to make them prosper in Lórien. Do you think you could remember how you made that elf? Which face and such you used?